As you may know Hart &Soul have joined forces with Melbourne nutritionist and blogger Melanie Lionello (@NaturallyNutritious) to bring the authentic flavours and natural ingredients of India to your kitchen. This Coconut Lentil Chicken Skewers will blow your mind by its simplicity and deliciousness. As us, Melanie likes to invigorate our tastebuds and bodies and also inspire something greater – a sense of place, community and authenticity. The Hart & Soul’s Coconut Lentil Soup is inspired by the dahl and lentil koottu’s at the heart of the South Indian diet. Using premium quality and all natural ingredients we, at Hart and Soul, believe everyone, regardless of time, should be able to enjoy the same relationship to food. Like Hart & Soul, Melanie understands the need for her recipes to combine taste with real, nutritional value. Her creamy and rich Coconut Lentil soup creation is the perfect example of her belief that health doesn’t have to compromise taste. real Kumera, lentils, capsicum and mung beans all heightened and united by a traditional mix of Indian spices. Mix together diced chicken and Hart & Soul Coconut & Lentil Soup until well covered. Thread chicken onto skewers so they fill almost the entire length. Heat non-stick frypan and cook skewers until browned and cooked through. Whilst they are cooking, mix together yoghurt, lemon juice, salt and pepper then warm naan bread in oven. 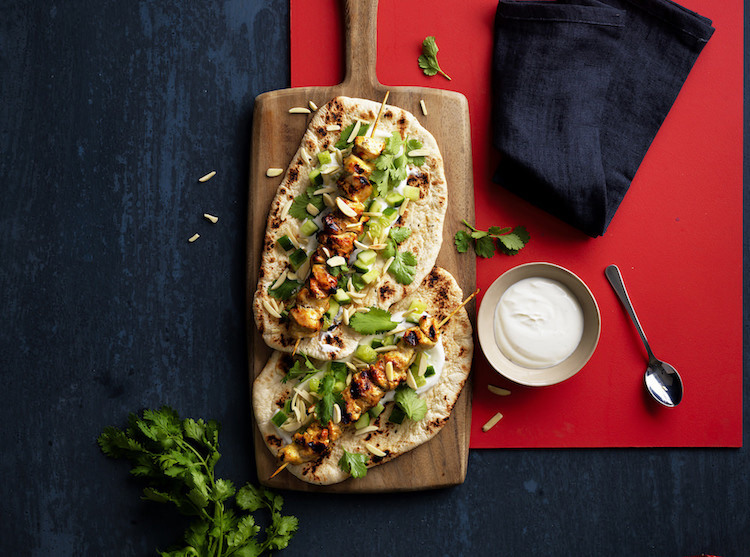 Spread even amounts of yoghurt onto the naan bread and top with diced cucumber.